Smart Systems are "intelligent" devices or systems which capture data from their environment over integrated sensors, process the data independently using electronics and related software, and react in an appropriate way to the signal by means of an actuator. Smart Systems are used in medical technology (e.g. intelligent implants), production engineering, the automotive industry (e.g. driver assistance systems), logistics, safety technology and information and communications technology. Safety aspects, reliability, miniaturization, energy consumption and intelligent data processing are critical factors in the development of intelligent systems. At Furtwangen University interdisciplinary research projects are carried out on technology developments for the manufacture of miniaturized sensors and actuators, on signal capture and processing, on the development of embedded systems, on smart implant systems and on optical systems. Smart systems research focuses on processes for the design, modelling, simulation, manufacture and characterization of minaturized systems. Modern CAD, FEM and VHDL tools are used for design and simulation. Highly-precise measuring instruments (AFM, SEM, various imaging interference processes, profilometer) are also available for characterization. Most of our projects are conducted in close collaboration with research partners such as the University of Freiburg, the Institute for Microtechnology and Information Engineering (Institut für Mikrotechnik und Informationstechnik), and the Fraunhofer Institute for Physical Measurement Techniques (Fraunhofer Gesellschaft für Physikalische Messtechnik) in Germany, as well as international partners such as the MFA Budapest (Hungary) and the Tula State University (Russia). The GenMik Mechanisms of Microstructure Generation cooperative PhD programme offered jointly with the University of Freiburg, IMTEK, also deals with this area of technology. The focus of smart systems' research is the improvement and adaptability of the intellligence of Embedded Systems with regard to their interaction with their environment and the extraction of information from sensors. On the one hand in interdisciplinary projects new sensors are developed which become more powerful through innovative signal changes. On the other hand, sensor data are analysed in a completely new way to gain new knowledge. For example current and voltage values from intelligent electricity meters (smart meters) is used to develop algorithms which refer back to the connected device. The research group of Prof. Benyoucef is involved in the development and research of signal change algorithms in Smart Systems. Currently there are significant advances in the areas of "miniaturization", "computerization" and "biologicifation", particularly in medical engineering. 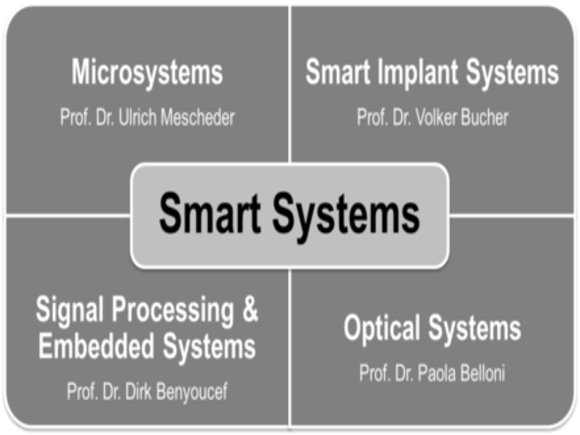 In the "Smart Implant Systems“ research area, miniature components and systems for medical technology and biological applications (micromedicine) are developed. Micromedicine is particularly important in the area of implants (integration of sensors, stimulation, neurosignal deflection, medicine dosing) and for telemetric processes. Smart Implant Systems provide innovative ways to observe the state of health of humans and to provide therapy for illnesses. They make it possible for patients to continue to live independently and support the sustainable goal of providing improved quality of life for an aging society. The Smart Implant Systems of micromedicine make it possible to treat illnesses more effectively through individualized medicine. This area of research is headed by Prof. Bucher. The focus of the work is on the development and validation of customized functional surfaces and materials for medical products, particularly for Smart Implant Systems. Particular emphasis is put on the long-term stability of implanted flexible electrode arrays. Prof. Bucher has a great deal of experience in the areas of thin film technology and micro-electrodes, as proven by 20 publications on the subject. There is a close cooperation with the Micromedicine and Surface technology AG of the Natural Science and Medical institute (NMI) at the University of Tübingen. Research involves light technology measurements, optical design and the use of LEDs in interiors and exteriors. Parameters such as efficient light cabling, light distribution, illumination levels, light density, light intensity, blending and colour rendering will be examined. Research fields include socially-relevant questions such as the development of cities, security, mobility and experiments into the connection between light and health.